Map of current distribution of Callisto instruments in April 2019. Update rate ~15 minutes, press reload to see latest status. One dot can represent up to 5 instruments. Statistics: more than 150 instruments at more than 90 locations worldwide. 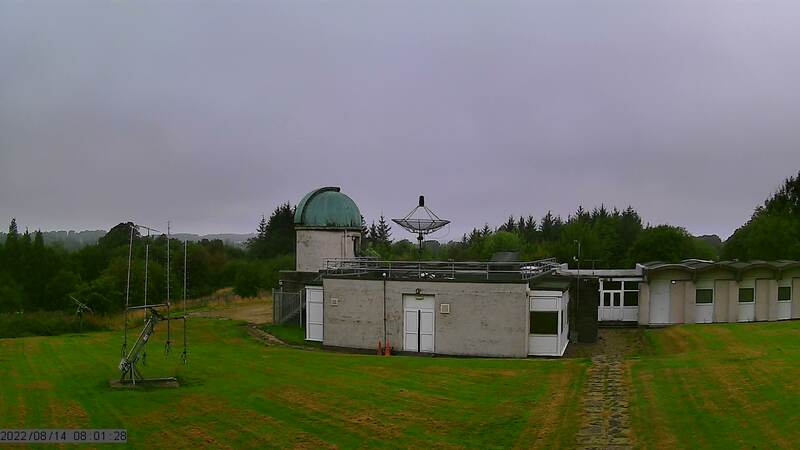 The CALLISTO spectrometer is a programmable heterodyne receiver designed 2006 in the framework of IHY2007 and ISWI by Christian Monstein (PI) as member of the former Radio Astronomy Group (RAG) at ETH Zurich, Switzerland. The main applications are observation of solar radio bursts and rfi-monitoring for astronomical science, education and outreach. The instrument natively operates between 45 and 870 MHz using a modern, commercially available broadband cable-TV tuner CD1316 having a frequency resolution of 62.5 KHz. The data obtained from CALLISTO are FIT-files with up to 400 frequencies per sweep. The data are transferred via a RS-232 cable to a computer and saved locally. Time resolution is 0.25 sec at 200 channels per spectrum (800 pixels per second). The integration time is 1 msec and the radiometric bandwidth is about 300 KHz. The overall dynamic range is larger than 50 dB. For convenient data handling several IDL-, PERL- and Python-routines were written. 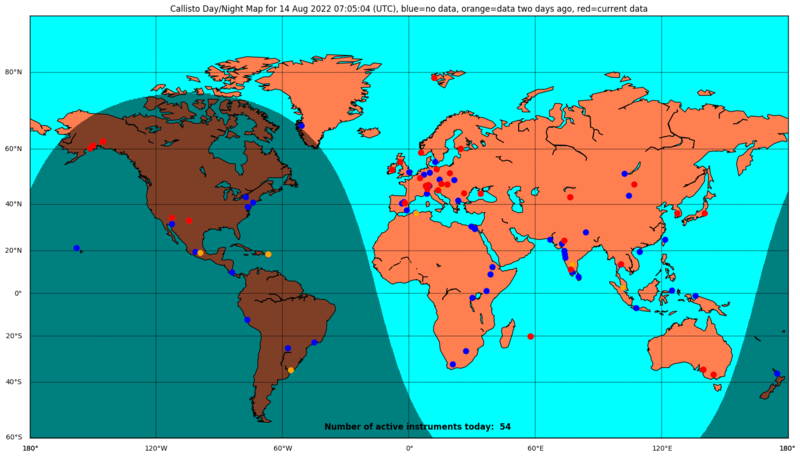 Many CALLISTO instruments have already been deployed, including: 10 spectrometers in India (2 in Ooty, 1 in Gauribidanur, 1 in Pune, 1 in Ahmedabad, 1 in Sangli, 2 in Bagalore, 1 in Nashik and 1 in Udaipur), one in Badary near Irkutsk, Russian Federation, two in Daejeon/South Korea, three in Australia (Adelaide, Melbourne and Heathcote), two in Hawaii, two in Mexico, one in Costa Rica, two in San Jose dos Campos/Brazil, three in Mauritius, 5 in Birr/Ireland, one in Ondrejov/Czech Republic, two in Ulaan Baatar/Mongolia, one in Germany (Essen), three in Cohoe and Anchorage/Alaska, two in Almaty/Kazakhstan, one in Cairo/Egypt, one in Nairobi/Kenya, 3 in Sri Lanka, four in Italy (3 in Trieste and 1 in Turin), two in Slovakia (Hurbanovo and Rotztoky), two in Humain/Belgium, 4 in Metsähovi/Finland, 8 in Switzerland (5 in Bleien, 1 in Zurich, 2 in Freienbach), 4 in Spain, 5 in Malaysia, 3 in Indonesia (Sumedong, Tomohon and Biak), one in Glasgow/Scotland/UK, one in Peru, one in Kigali/Rwanda, one in Pakistan, 2 in Denmark, one in Japan, one in South Africa, two in Kangerlussuaq/Greenland, 6 in Austria, one in Montevideo/Uruguay, two in Norway, one in Nepal, two in Thailand and two in Ethiopia (Addis Ababa and Mekelle). 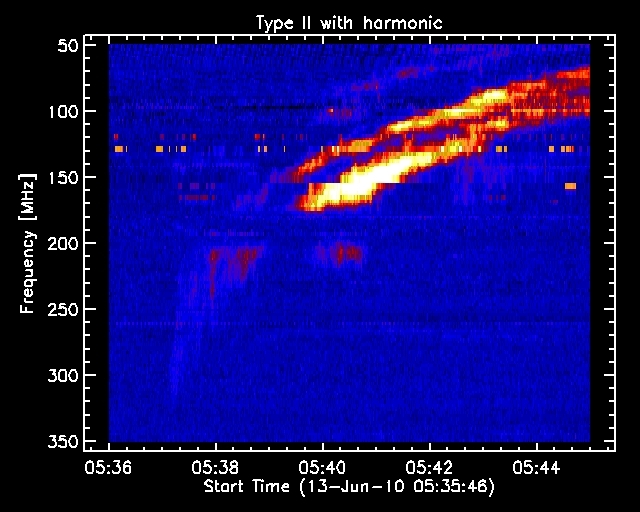 Through the IHY/UNBSSI and ISWI instrument deployment program, CALLISTO is able to continuously observe the solar radio spectrum for 24h per day through all the year. All Callisto spectrometers together form the e-Callisto network. Callisto in addition is dedicated to perform radio-monitoring within its frequency range with 13'200 channels per spectrum. The frequency range can be expanded to any range by switching-in a heterodyne up- or a down-converter. Data from individual instruments are automatically uploaded by FTP to the central server at FHNW. Instrument deployment including education and training of observers was financially supported by SNF, SSAA, NASA, Institute for Astronomy and ETH Global, formerly known as North-South Center of ETH Zurich and a few private sponsors. Data access is free for everybody but we would appreciate credit to the Institute for Data Science FHNW Brugg/Windisch, Switzerland. In case Callisto data are used for any publications, the instrument PI expects to be invited to be a co-author of the paper. possibly give comments, and decide whether he chooses to be a co-author. Note that the explicit confirmation from the PI is needed for him to appear as a co-author on any such publication. Affiliation and adress for co-authorship: Christian Monstein, Istituto Ricerche Solari Locarno (IRSOL), Via Patocchi 57, 6605 Locarno Monti, Switzerland. Donations via PayPal to maintain this website and data archive at FHNW are always welcome. 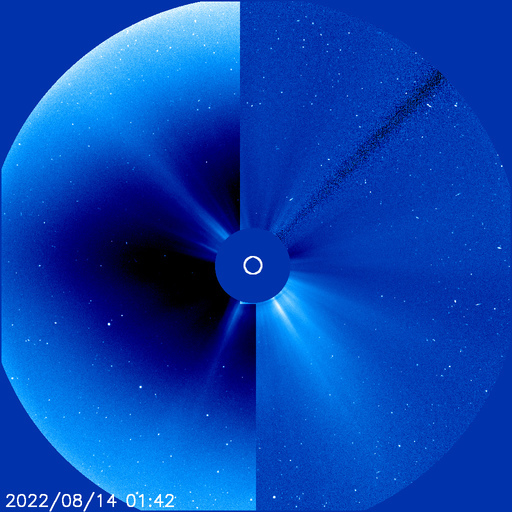 Solar Activity now (courtesy SWPC/NOAA) and GSFC/NASA. Christian Monstein is a native of Switzerland and lives in Freienbach. He obtained Electronics Engineer at Konstanz University, Germany. Christian is a SARA member and is licensed as amateur radio operator, HB9SCT. He has 20 years of experience designing test systems in the telecommunications industry and is proficient in several programming languages including C++, IDL and PYTHON. 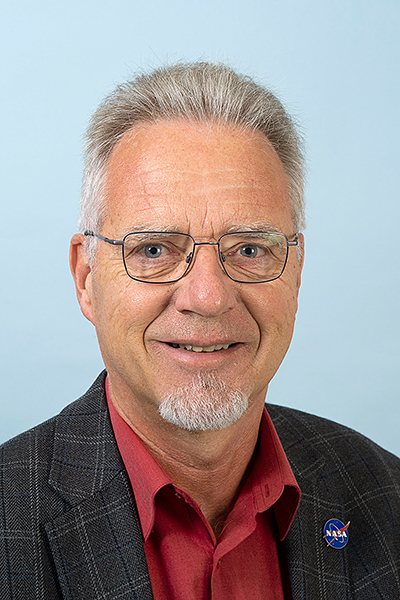 He has worked at ETH-Zürich on the design of frequency agile radio spectrometers, FFT-spectrometers, radio receivers and noise calibration transmitters as payload on a drone. He also has participated in the European Space Agency (ESA) space telescope Herschel (HIFI), European Southern Observatory (ESO) project MUSE for the VLT in Chile. Recently, he was involved in the radio astronomy project 'BINGO' in Uruguay / Brazil and in 'HIRAX' in South Africa. He is still responsible for the hardware and software associated with the e-CALLISTO Project. He plays also the role of a coordinator of SetiLeague in Switzerland and he was also representing Switzerland within CRAF. He is still a member of the ISWI steering committee at UN office for outer space affairs in Vienna (UNOOSA) and has just been nominated as a member of ITU.